Appropriate post-operative rehab can be as important to the success of your surgery as the operation itself. We work with a variety of therapy providers throughout the Louisville area, western Kentucky and Southern Indiana. In many cases, your therapy location may already have a copy of our specific physical therapy protocols. If you would like a personal copy, or your therapist needs a protocol, please see below for a downloadable procedure specific rehabilitation protocol. This protocol is intended as a general guideline for the therapist in directing the post-operative rehabilitation course following a reverse shoulder replacement. The timing of recovery and ultimate outcome following reverse shoulder replacement is variable, often depending to some extent on the integrity of remaining rotator cuff musculature and deltoid strength. Modifications to the protocol may be needed to accommodate patients who recover either more quickly or more slowly than this protocol. 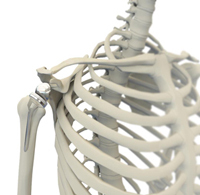 This protocol is intended as a general guideline for the therapist in directing the post-operative rehabilitation course of patients undergoing a total shoulder replacement. Modifications and alterations may be necessary depending on each patient's recovery. Emphasis should be placed initially on protecting the subscapularis repair, followed by establishing scapular control and mobility, supine ROM, and lastly strength and resistance training. This protocol is designed to assist the therapist in directing the post-operative recovery of patients following an arthroscopic rotator cuff repair. This protocol is a general outline of the anticipated progress for the majority of repairs. In cases of anticipated post-operative stiffness or PASTA repairs, this protocol may be accelerated. Alternatively, in massive, retracted multi-tendon repairs, it may be delayed with strengthening after 14-16 weeks in some cases. 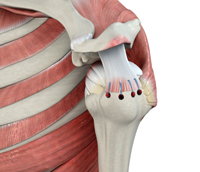 In subscapularis repairs, passive external rotation should advanced slowly, as should internal rotation against resistance. Please note this protocol is intended solely for use in patients receiving an isolated bovine collagen graft for treatment of a partial thickness rotator cuff tear. For patients in whom the graft is used as an adjuvant to a revision rotator cuff repair of a full thickness defect please follow the rotator cuff repair protocol above.